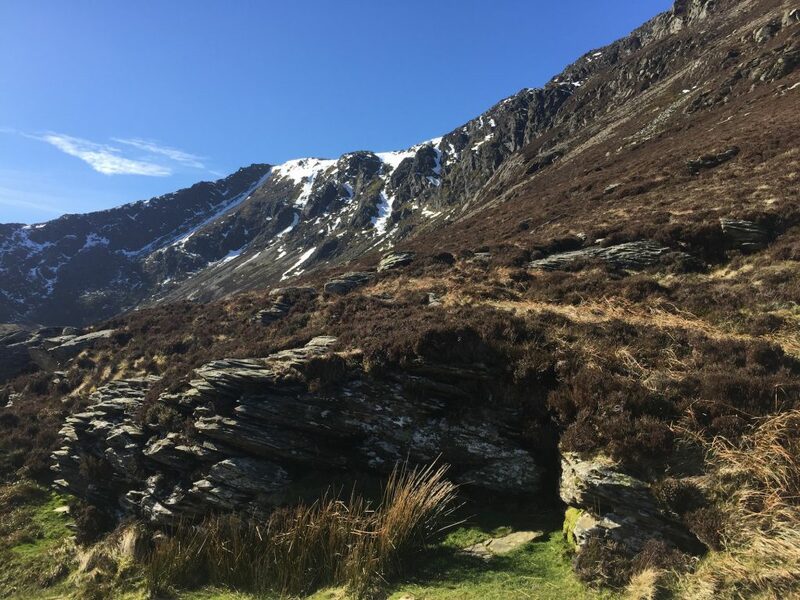 Moel Siabod in the Moelwynion range in Snowdonia. 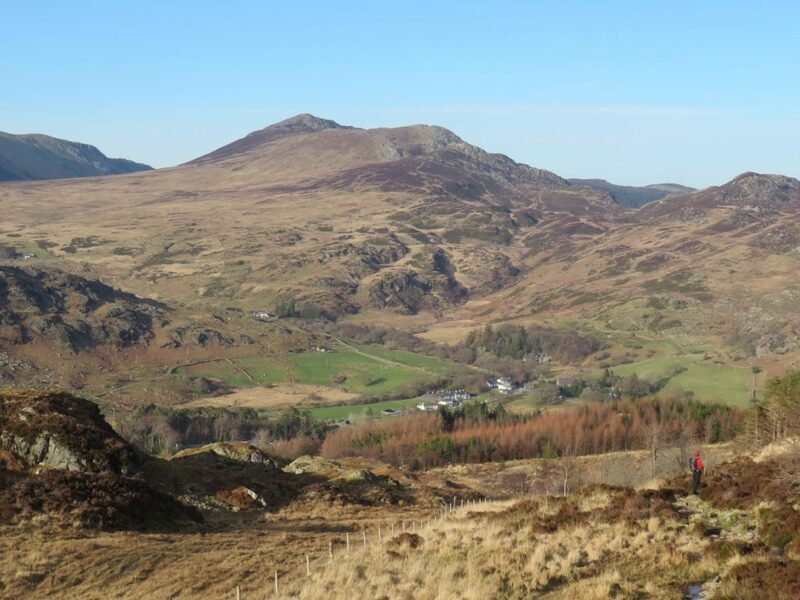 Moel Siabod stands at 2,861 feet or 872 metres and is the highest mountain in the Moelwynion range in Snowdonia. 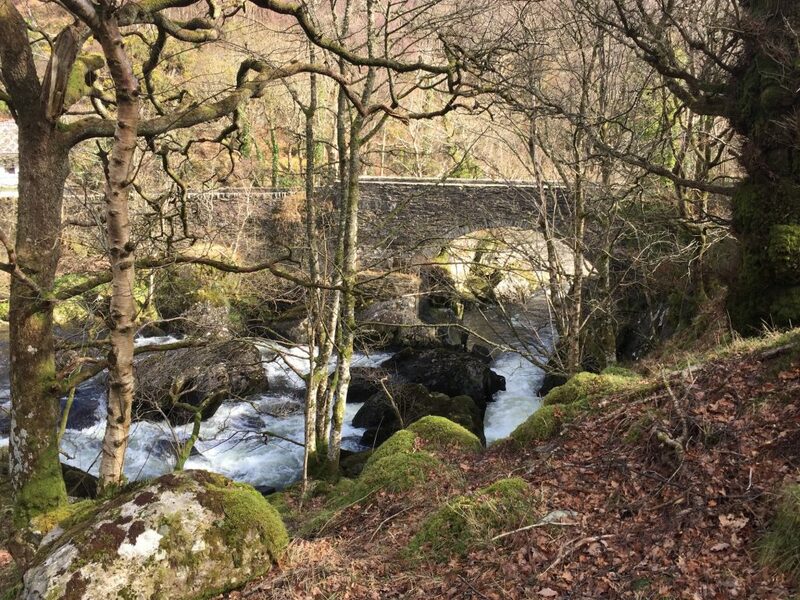 It is situated above Betws -y- Coed and Capel Curig and is close to the UK National Outdoor Activity Centre Plas y Brenin. 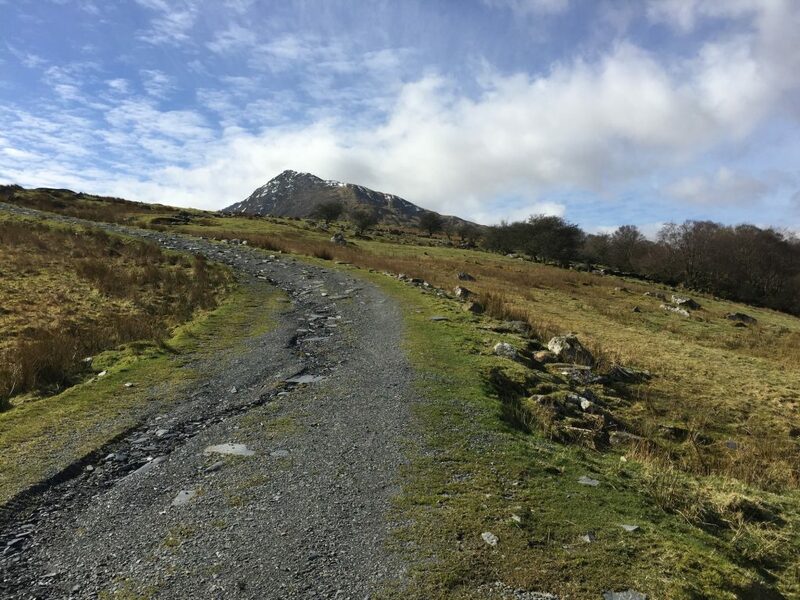 Siabod stands on its own and – as it just misses the 3000 feet mark – it so often gets overlooked by walkers who head for the better known mountains. 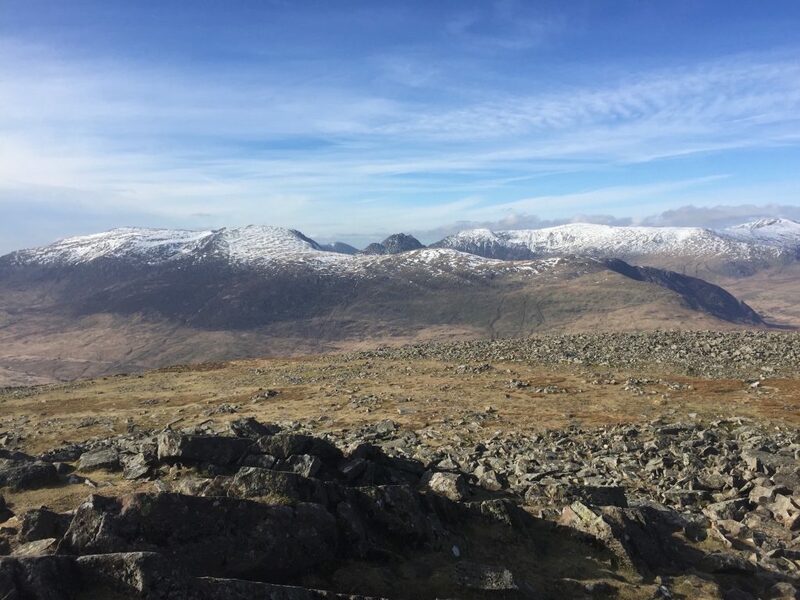 However, the summit commands very impressive views of the main mountain ranges (Snowdon Massif, Glyderau and Carneddau). 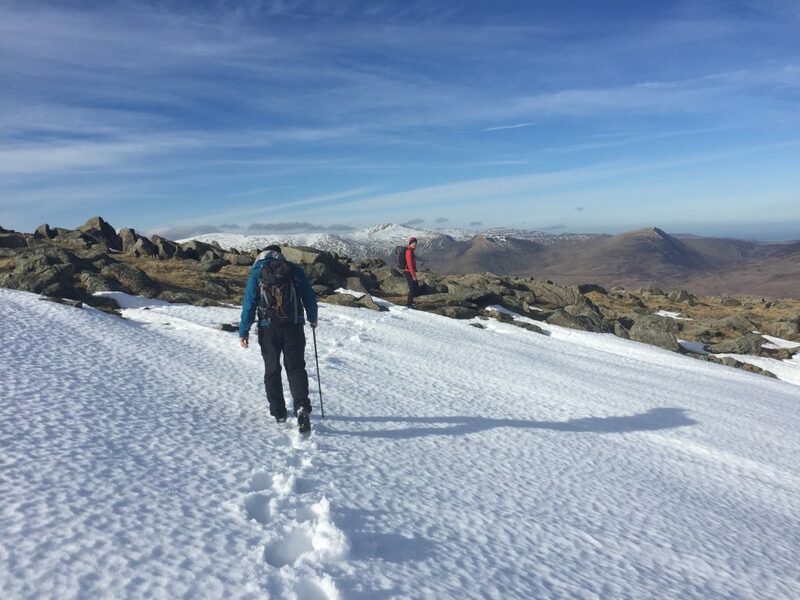 13 of the 14 highest peaks (over 3000ft ) can all be seen from the top. 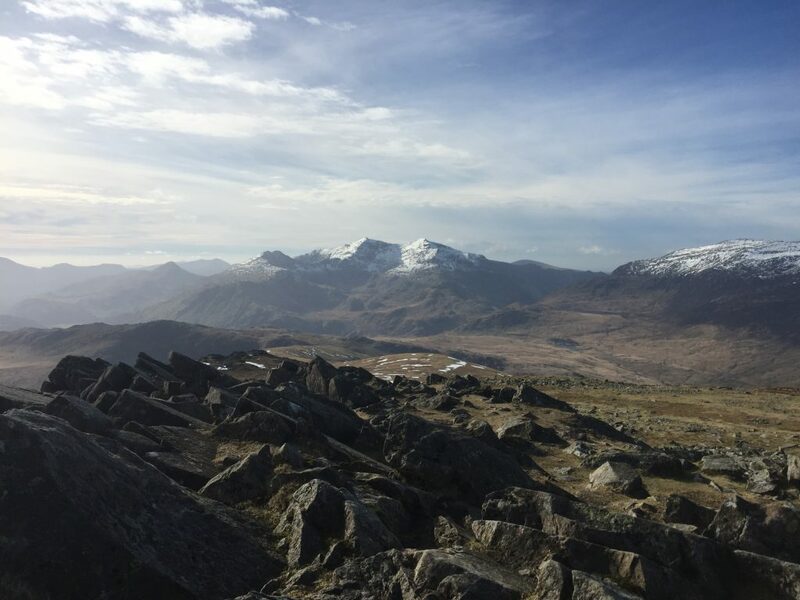 This spectacular uninterrupted 360 degree panarama is surely one of the finest views in Snowdonia and is well worth the climb and effort. It was a cold but sunny March morning. 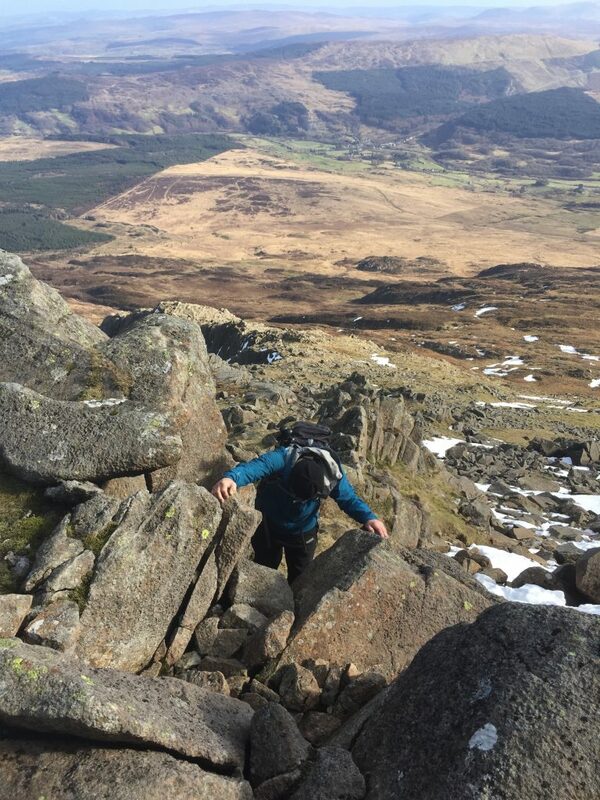 We chose to climb Siabod as it is in a more sheltered position and we were not fully equipped for the more severe winter conditions on Snowdon or other similar peaks at that time. 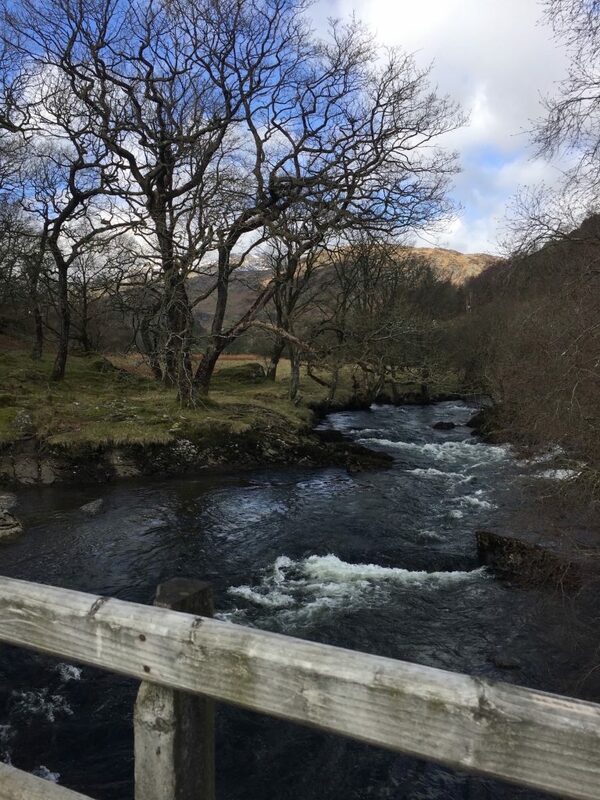 We began at the Moel Siabod cafe crossed over river Llugwy (Afon Llugwy). 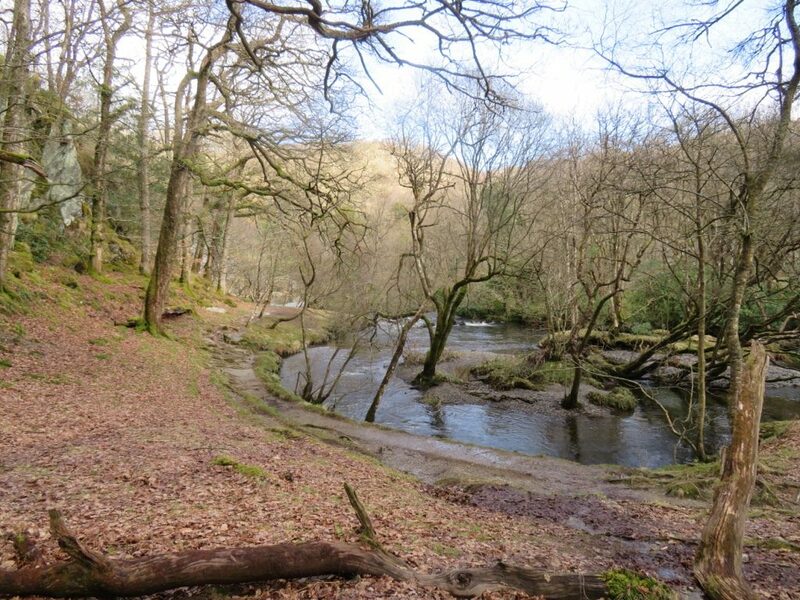 Here we could see dippers and could hear skylarks which – for us – were among the first signs of Spring. 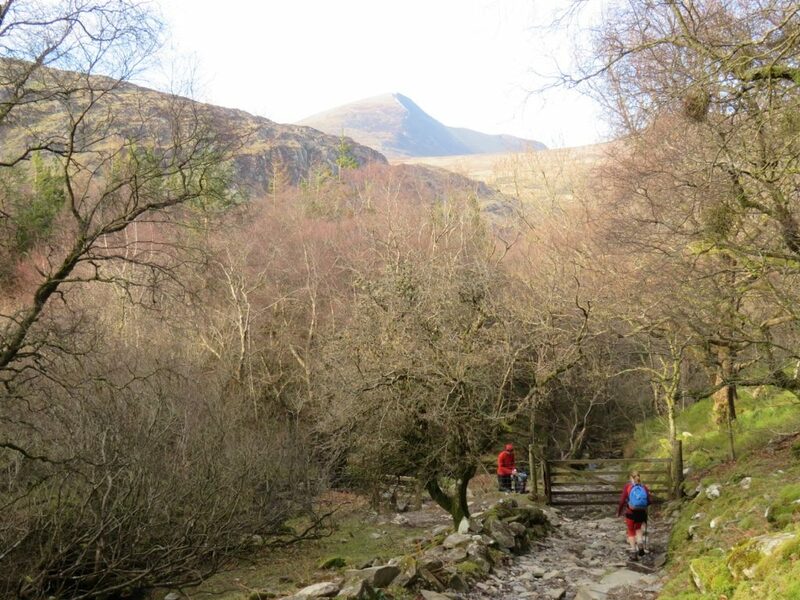 We followed the river to Pont Cyfing where we picked up the footpath and began our ascent. 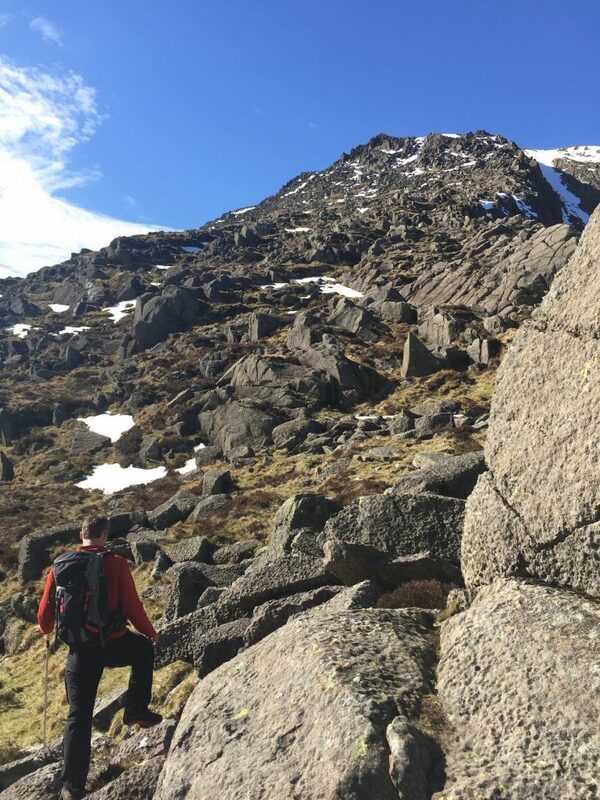 We steadily gained height and soon reached a tarn (no name) on our left. 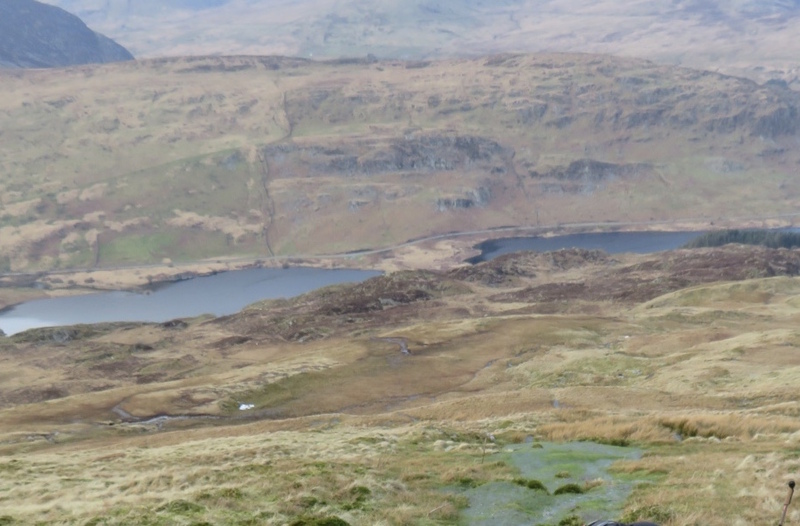 We continued along the path with the tarn behind us but still in sight. 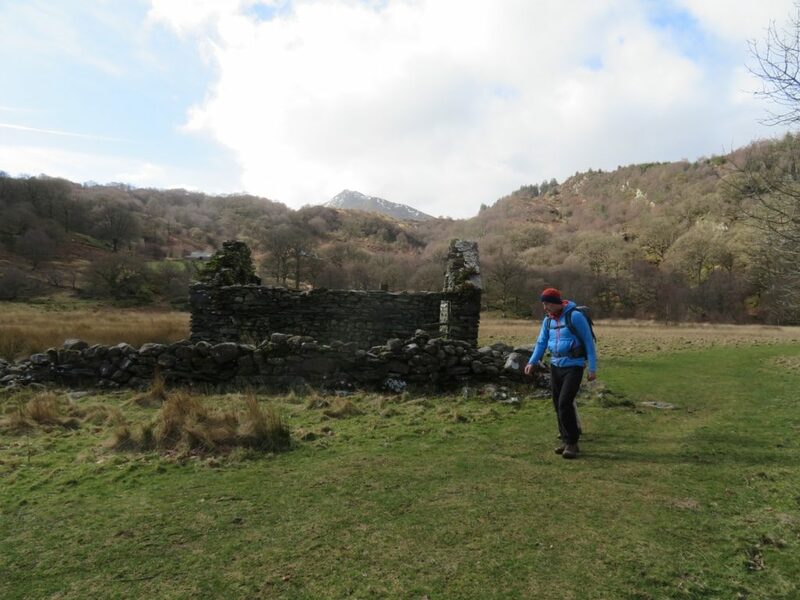 We then came a cross a disused quarry and the remains of mine buildings on our right. 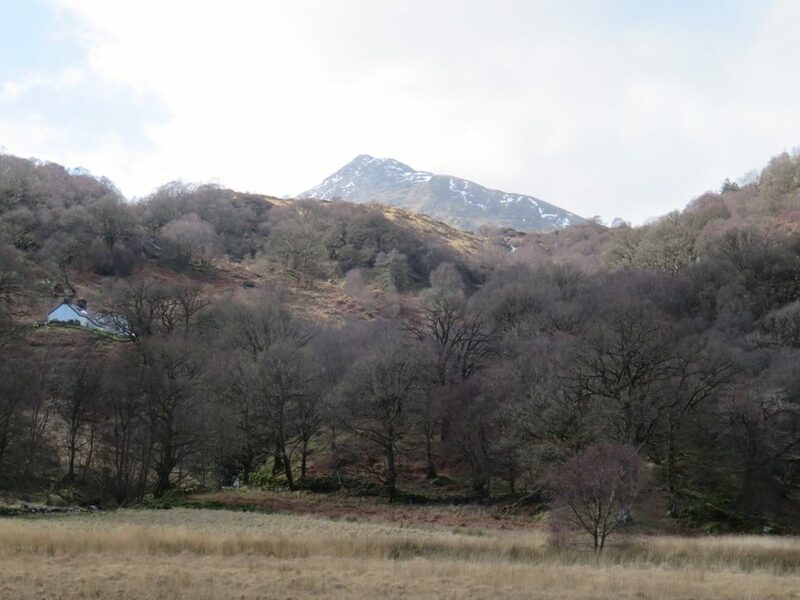 Soon after,we could clearly see the Eastern ridge Daear Ddu. 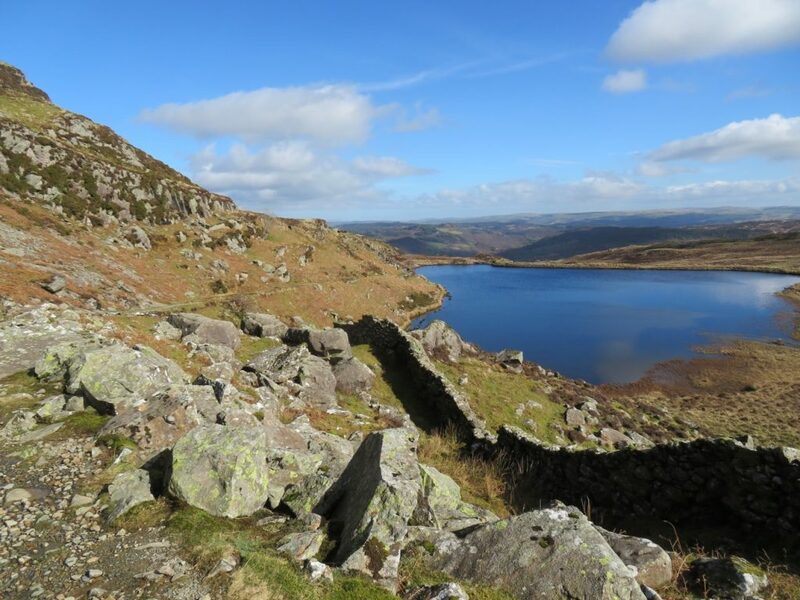 The third lake Lyn y Foel was now clearly in view. 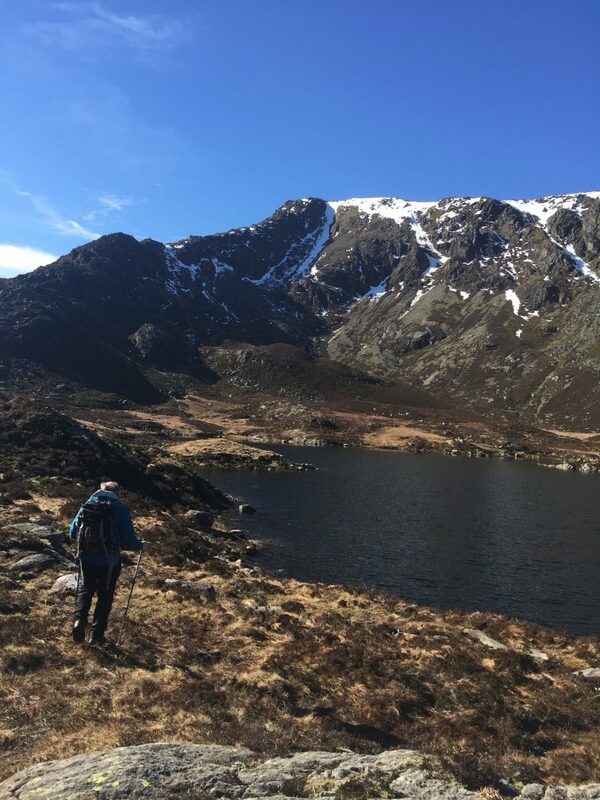 It became quite boggy and marshy as the path disappeared but the route along the ridge was clear. We walked left around the lake and found a perfect lunch spot. 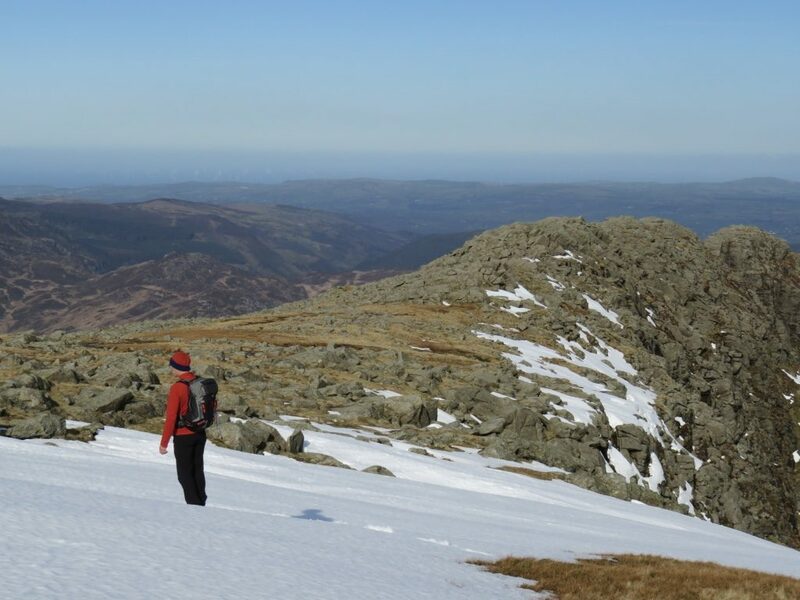 We could clearly see the eastern ridge which was to be our route to the summit. 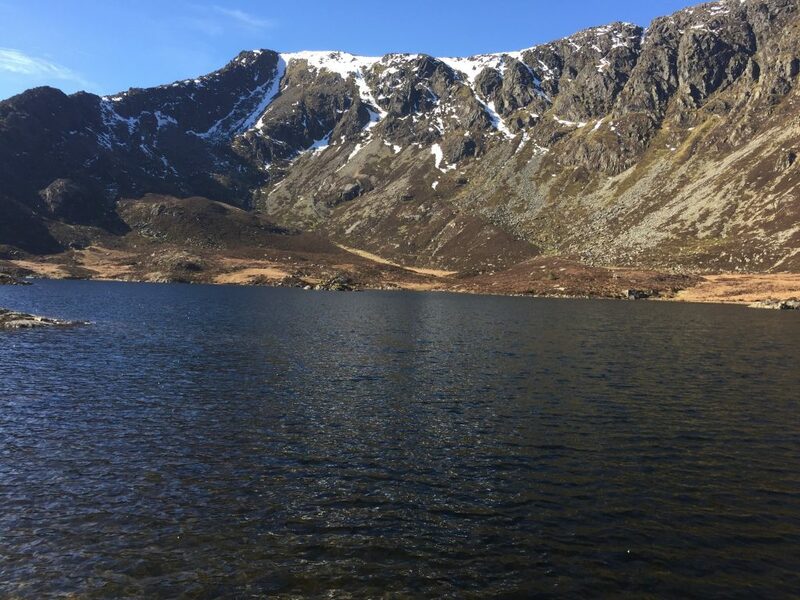 We stopped for lunch by the side of the lake before beginning our scramble to the top. It was a very atmospheric spot. 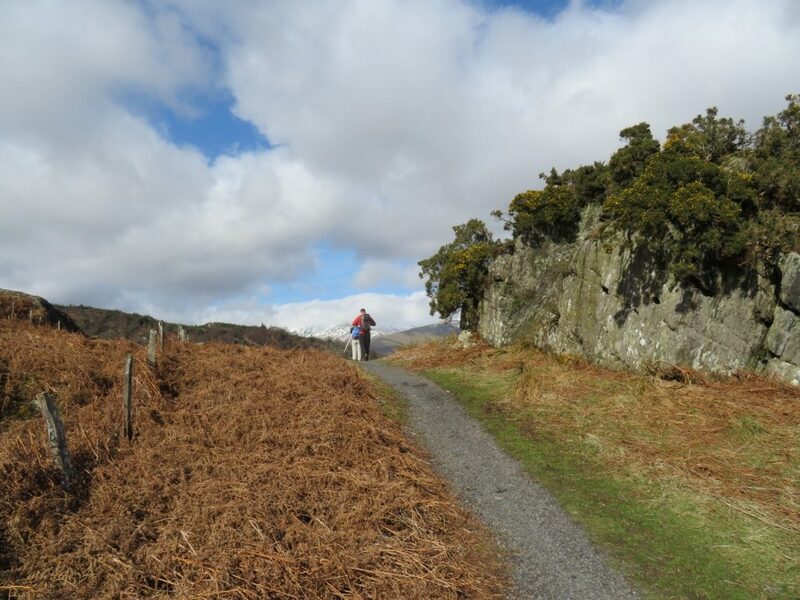 The ridge looks daunting but it is quite a broad ridge . It can be reached without even a grade 1 scramble…you pick you can make the scramble as easy or as difficult as you like. 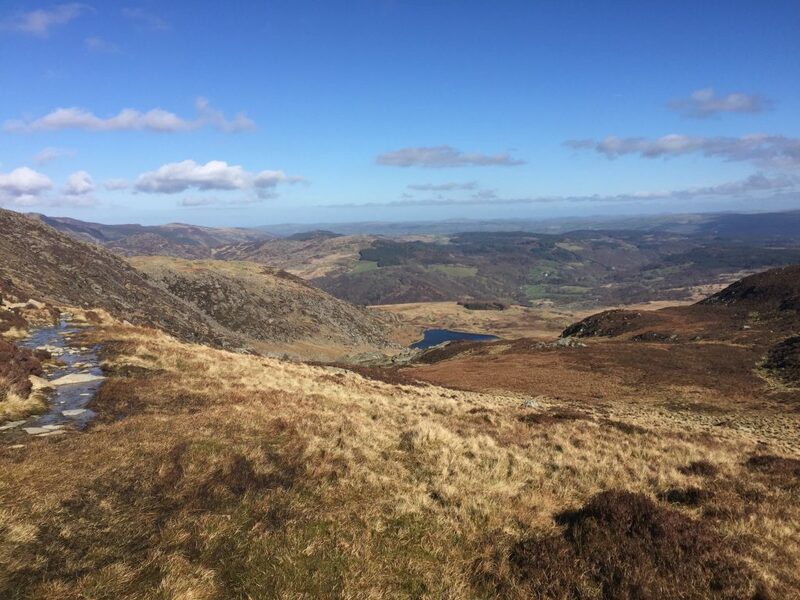 After about 800 ft of ascent scrambling along the South Eastern ridge Daear Ddu, you reach the summit and the fabulous views open up. 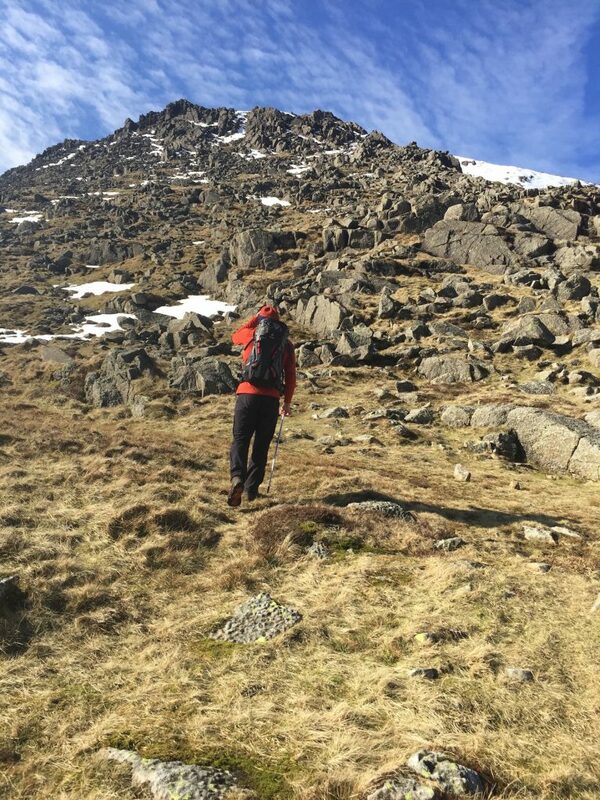 It’s quite a wide ridge but does involve a bit of low level scrambling. 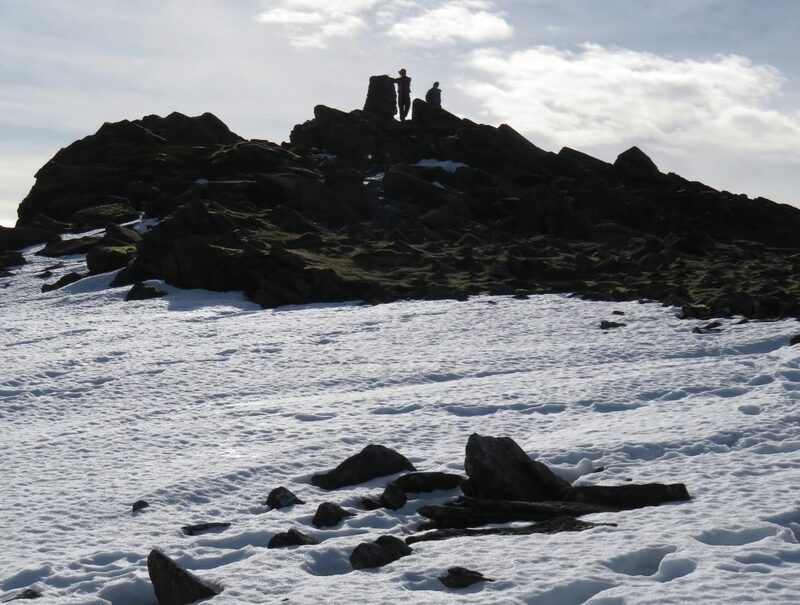 Before long we’d completed the ridge and could see the summit cairn to our left once we’d walked the ridge, gaining unbelievable views from the summit. 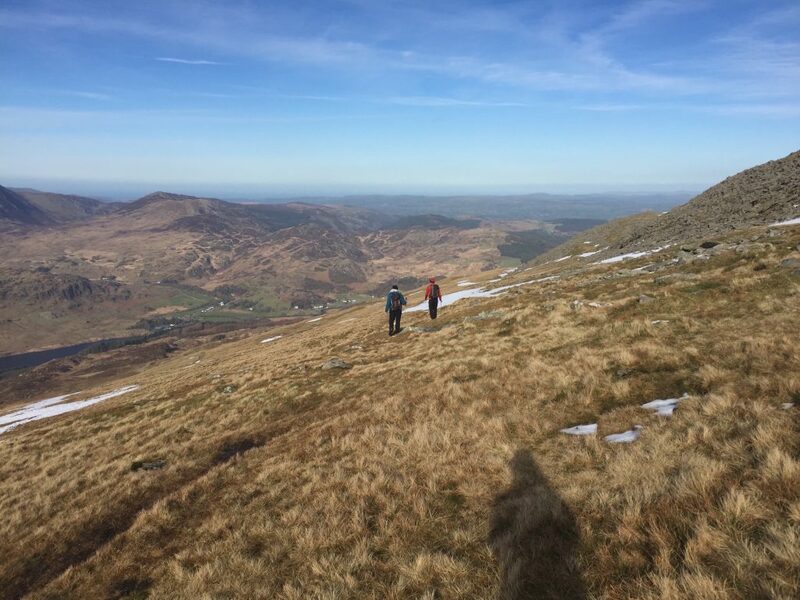 We then made our way across the top before dropping down towards the left and picking our way steadily down back towards the forested area in Capel Curig. 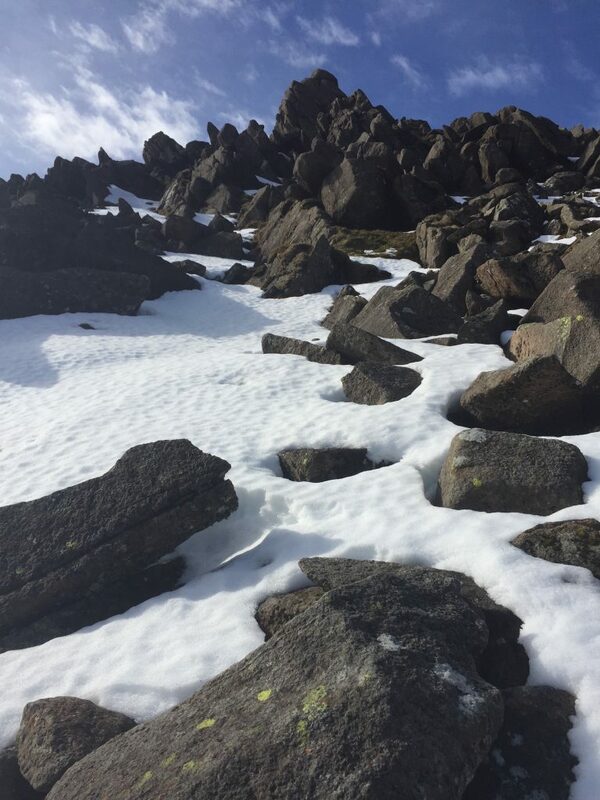 Although a perfect spring day there was still snow along the summit ridge. We picked our way steadily down through the boggy ground. About half way down we discovered two natural springs and promptly refilled our water bottles. It was, quite literally, the best water we’d ever tasted. 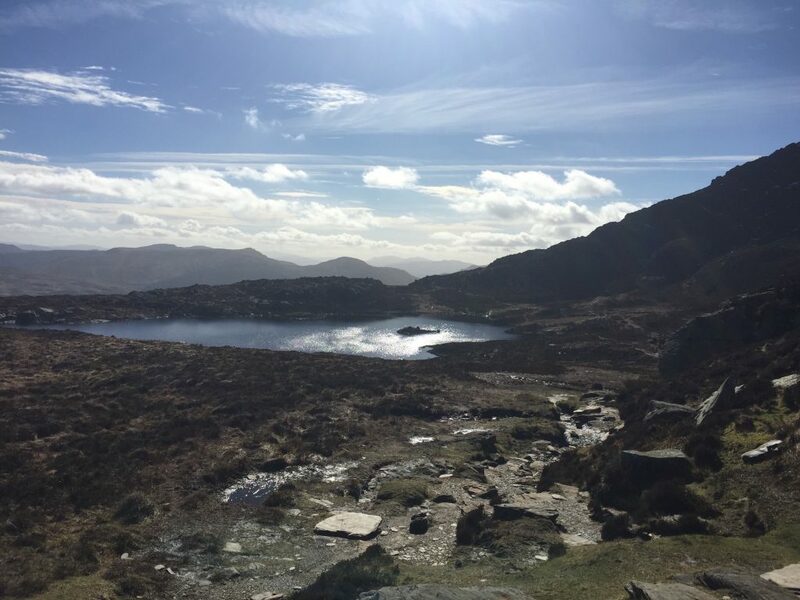 Our day on Siabod was an unforgettable experience. 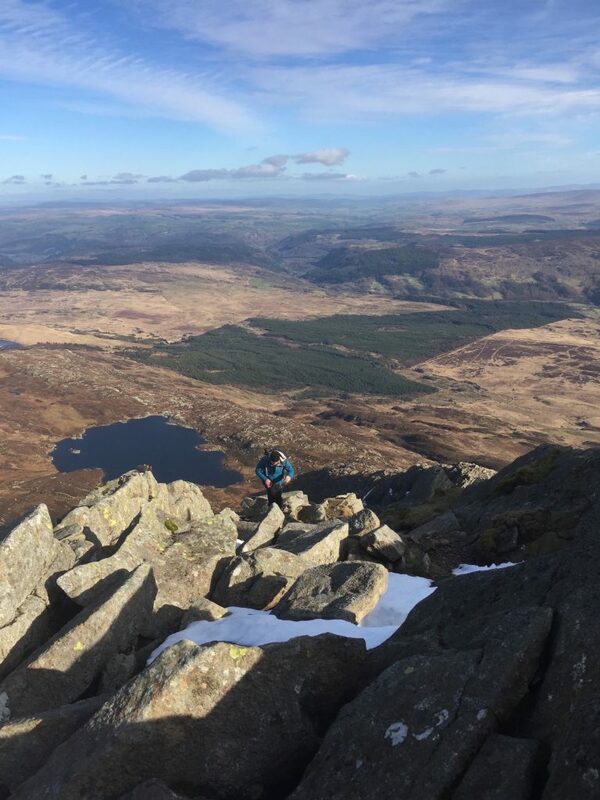 Siabod is a must visit mountain and does not draw the same crowds as others such as Snowdon, or Glydderau. In fact, we only came across a small school group, a couple and a dog walker in the 5 hours on the hill. 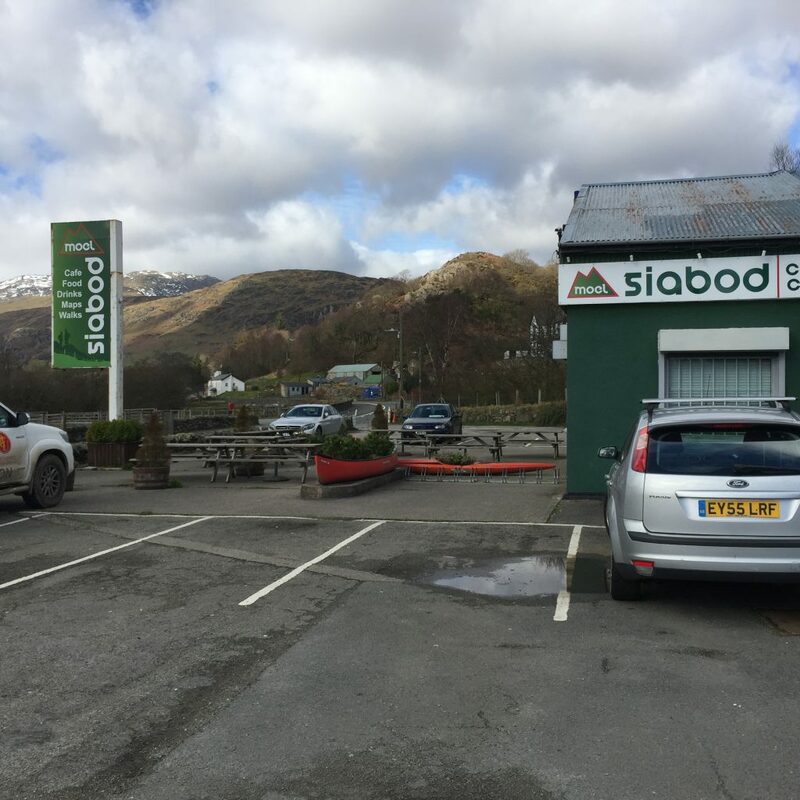 It was lovely to stop at the Siabod cafe at the end of our walk to finish off a great day with tea and cake. ← South West Coast Path highlights.